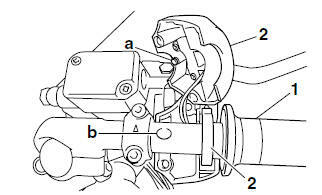 Front brake master cylinder "1"
Front brake master cylinder holder "2"
Align the mating surfaces of the brake master cylinder holder with the punch mark "b" on the handlebar. Be sure to position the washer between the throttle grip and the right handlebar switch. Lubricate the end of the throttle cable and the inside of the throttle grip with a thin coat of the lithium-soap-based grease, and then install the throttle grip onto the right handlebar. Route the throttle cable through the slot in the throttle grip, and then install the cable. Align the projection "a" on the right handlebar switch with the hole "b" on the right handlebar. There should be 1-3 mm (0.04-0.12 in) of clearance "a" between the throttle grip and the right grip end. 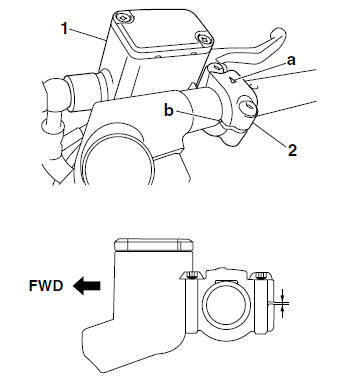 Align the mating surfaces of the clutch lever holder with the punch mark "a" on the left handlebar. 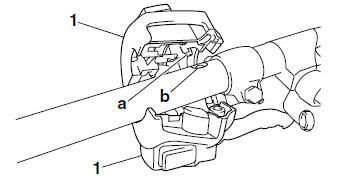 Align the projection "a" on the clutch switch with the slit "b" in the clutch lever holder. Lubricate the end of the clutch cable with a thin coat of lithium-soap-based grease. Align the projection "a" on the left handlebar switch with the hole "b" in the left handlebar. a. Apply a thin coat of rubber adhesive onto the end of the left handlebar. b. Slide the handlebar grip over the end of the left handlebar. c. Wipe off any excess rubber adhesive with a clean rag. Do not touch the handlebar grip until the rubber adhesive has fully dried. There should be 3 mm (0.12 in) of clearance "a" between the handlebar grip and the grip end. Make sure the main switch lead, brake hose, throttle cable, clutch cable, and handlebar switch leads are routed properly. Refer to "CABLE ROUTING" on page 2-33. Clutch lever free play Refer to "ADJUSTING THE CLUTCH CABLE FREE PLAY" on page 3-12. Throttle cable free play Refer to "ADJUSTING THE THROTTLE CABLE FREE PLAY" on page 3-6.